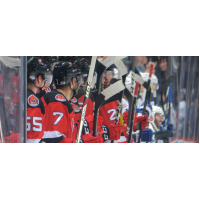 BINGHAMTON, N.Y. - The Binghamton Devils and Toronto Marlies combined for 12 goals on Saturday night, but, it was the Devils coming away with the 7-5 victory in front of 4,220 fans in the home opener at Floyd L. Maines Veterans Memorial Arena. Sam Gagner set up Chris Mueller with a pass to get the Marlies going just 7:19 ito the game. From the bottom of the right wing circle, Gagner fired the puck across the top of the crease and Mueller beat goaltender Cam Johnson on the right leg pad for the one-goal lead. Marian Studenic responded for the Devils on the power play to tie the game at one. After receiving a pass in the left circle, Studenic let a wrist shot go that beat Toronto goaltender Jeff Glass on the glove side at 10:39 with assists from Yegor Yakovlev and Blake Pietila. Right after the Devils tied the game, Sam Gagner took the puck off the wall and ripped a slap shot over the left shoulder of Johnson to give the Marlies the lead once again, 2-1. The goal was unassisted and came at 11:05 of the first. Binghamton recorded the next two goals to take a 3-2 lead into the first intermission. Nick Lappin left the puck in the offensive zone for Colton White who sent a wrist shot over the left shoulder of Glass for his first of the year at 12:05 of the first. Assists on White's goal were given to Lappin and Brett Seney. At 18:12, Yakovlev fed Lappin on the right side of the crease to give the Devils their first lead of the night, 3-2. After one period, Binghamton led Toronto by one goal with the shots favoring the Marlies, 15-10. Gagner put home his second of the night with a power-play goal 6:23 into the second period to tie the game, 3-3. Gagner's goal was assisted by Mueller and Dmytro Timashov as he lifted the shot over the shoulder of Johnson from the top of the circles. Binghamton score back-to-back goals for the second time of the game to take a two-goal lead after 40 minutes. Nathan Bastian forced a turnover below the goal line and jammed the puck in on the side of the net for a 4-3 lead at 11:05 with the assist to Joey Anderson. Blake Speers provided the goal that put the Devils up by two with just 2:52 left in the middle period. Yegor Sharangovich forced a turnover and fed Speers who beat Glass for the two-goal lead after two periods. Shots in the second period favored the Devils, 14-10. Just 0:27 into the final period, Bastian added to the lead as he banked the puck off a defender in front of the net and the puck slid betweent he legs of Glass for the 6-3 lead on his second of the night. The lone assist was credited to Kurtis Gabriel for the three-goal advantage. Toronto pulled within a goal after Trevor Moore and Andreas Borgman scored just minutes apart before the midway point of the third period. Moore's goal was his third of the weekend in just two games at 5:55 and Borgman made it a one-goal game at 9:22 with his first. After killing off a late penalty to Lappin, Pietila put in an empty-net goal and sealed a 7-5 win for Binghamton. Johnson recorded the only assist, his first professional point, and collected his first professional win in the same game, denying 29 of 34 shots. The Devils return home Wednesday to face the Hartford Wolf Pack at 7:05 p.m. Fans can get one dollar hotdogs, four dollar beer, and kids 12 and under are just $10.